Traditionally, physicians and dietitians have encouraged many patients, especially postmenopausal women and older men, to take calcium supplements to maintain bone health. Since 99% of this mineral is stored in bones and teeth, this seemed to be a logical recommendation. But now calcium supplementation has come under scrutiny since research has cast doubt on its effectiveness to protect against bone fractures and has shown a possible link to cardiovascular disease (CVD) and an increased risk of kidney stones. Make no mistake: Calcium still is a necessary mineral. It helps build bone and maintain bone strength. It’s required for vascular contraction and vasodilation, muscle function, nerve transmission, and intracellular and hormonal signaling. Because of its vital role in human health, the Recommended Dietary Allowance (RDA) for calcium is 1,000 mg/day for women up to age 50 and men up to age 70, and 1,200 mg for anyone older. According to the most recent research on calcium supplementation, the best way to meet these daily requirements is through dietary sources. Earlier this year, the US Preventive Services Task Force, an independent and volunteer panel of national experts in prevention and evidence-based medicine, finalized recommendations regarding calcium and vitamin D supplementation, concluding there’s no evidence showing that calcium supplements reduce the risk of fractures in most people.1 The final recommendation statement applies to individuals without osteoporosis who live at home and not in assisted-living or nursing home facilities. The task force further concluded that there isn’t enough evidence to determine whether calcium and vitamin D supplements can prevent fractures in men and premenopausal women; that 1,000 mg or less of calcium and 400 IU of vitamin D don’t prevent fractures in postmenopausal women and therefore aren’t recommended for this purpose; and that there isn’t enough evidence to determine whether calcium and vitamin D supplements at larger doses can prevent fractures in postmenopausal women. Conversely, researchers who reanalyzed data from the landmark Women’s Health Initiative (WHI) trial did find that 1,000 mg of calcium and 400 IU of vitamin D supplements were linked to a decreased risk of only hip fractures and not total fractures.2 This occurred in a subgroup of adherent supplement takers, with an especially large risk reduction in those who had taken the supplements for several years. In general, however, calcium supplementation alone doesn’t appear to offer protection against bone fractures. Research has shown a link between calcium supplementation and increased CVD risk, although the evidence has been conflicting. Some recent studies, however, still are raising concerns. A Swedish study involving more than 61,000 women found that those who consumed 1,400 mg of calcium per day from food and supplements had higher mortality rates, including death from CVD, compared with those who consumed between 600 and 1,000 mg of calcium per day.3 Women whose dietary calcium intake exceeded 1,400 mg per day and who took additional calcium supplements experienced higher mortality rates than those who consumed a similarly high calcium intake but without supplements. In the National Institutes of Health-AARP Diet and Health Study, researchers followed more than 388,000 individuals for 12 years. Men who took more than 1,000 mg of calcium supplements per day had a 20% greater risk of dying from CVD.4 Researchers saw no such risk in the women they followed, and they found that dietary calcium intake was unrelated to CVD death in both men and women. Data from the WHI study (including the reanalysis) consistently showed an increased risk of kidney stones associated with calcium supplementation. Researchers saw a 17% higher risk of kidney stone development in women who took more than the RDA for calcium, mainly from supplements, compared with controls who consumed amounts closer to the RDA limits.5 Researchers also found that the rates of self-reported kidney stones didn’t differ among various demographic groups or risk factors such as BMI, physical activity, alcohol use, and vitamin C, sodium, oxalic acid, and protein intake, thereby making supplemental calcium the likely culprit. The US Preventive Services Task Force also recognized the link between calcium supplementation and kidney stone risk in its recommendation statement. “It’s a modest increase in risk, but it cannot be ignored,” Moyer says. Dietitians don’t recommend calcium supplements over dietary sources, and the hope is that the literature will encourage other health care professionals to follow suit. Dietitians should quantify the amount of dietary calcium clients consume and determine the number of milligrams they get in their daily multivitamin, since many brands geared toward women contain 500 mg of calcium. In addition, RDs should assess their clients’ antacid use. There’s a good chance that most people can meet the RDA amounts without the need for calcium supplementation. What’s important to note is that oxalic and phytic acids in certain foods bind to calcium and can inhibit its absorption. According to the National Institutes of Health, eating various calcium-containing foods will offset these interactions, which are accounted for in the Dietary Reference Intakes for calcium that factor in differences in calcium absorption in varied diets.6 Informing clients about the various nutrients they’ll receive when choosing calcium-containing foods and beverages will encourage them to eat more of these items. Calcium supplements may be warranted for clients who can’t get enough dietary calcium. 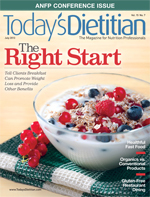 “The Academy of Nutrition and Dietetics does not have a singular stance regarding calcium supplementation per se but recognizes that nutrient supplementation may be useful when it fills a specific identified nutrient gap that cannot or is not otherwise being met by an individual’s food intake,” says Heather Mangieri, MS, RDN, CSSD, a spokesperson for the organization. Nutrient supplementation can’t replace a healthful diet, she adds. When counseling clients about calcium consumption, encourage them to choose food sources first. If they’re unable to meet RDA requirements for calcium with diet alone, give them guidance on supplementation. Remind them that more doesn’t necessarily mean better. Suggest they space out the amount of calcium they consume from food or supplements throughout the day, and make sure they’re getting enough vitamin D to improve absorption. — Linda Antinoro, JD, RD, LDN, CDE, is a freelance writer and member of the Nutrition Consultation Service at Brigham and Women’s Hospital in Boston. The author would like to recognize Sarah Gold, a dietetic intern at Brigham and Women’s Hospital, for her assistance with this article. 1. Moyer VA; US Preventive Services Task Force. Vitamin D and calcium supplementation to prevent fractures in adults: US Preventive Services Task Force Recommendation Statement. Ann Intern Med. 2013;158(9):691-696. 2. Prentice RL, Pettinger MB, Jackson RD, et al. Health risks and benefits from calcium and vitamin D supplementation: Women’s Health Initiative clinical trial and cohort study. Osteoporosis Int. 2013;24(2):567-580. 3. Michaelsson K, Meihus H, Lemming EW, Wolk A, Byberg L. Long term calcium intake and rates of all cause and cardiovascular mortality: community based prospective longitudinal cohort study. BMJ. 2013;346:f228. 4. Xiao Q, Murphy RA, Houston DK, Harris TB, Chow WH, Park Y. Dietary and supplemental calcium intake and cardiovascular disease mortality: the National Institutes of Health-AARP Diet and Health Study. JAMA Intern Med. 2013;173(8):639-646. 5. Wallace RB, Wactawksi-Wende J, O’Sullivan MV, et al. Urinary tract stone occurrence in the Women’s Health Initiative (WHI) randomized clinical trial of calcium and vitamin D supplements. Am J Clin Nutr. 2011;94(1):270-277. 6. Dietary supplement fact sheet: calcium. National Institutes of Health Office of Dietary Supplements website. http://ods.od.nih.gov/factsheets/Calcium-HealthProfessional. Reviewed March 14, 2013. Last accessed May 2013.